The win gives Johnson 17 PGA Tour titles on his career, the second most of any player since 2008, one behind Tiger. Johnson looked like the best player in the world. When he's on, he is in a class that only a few players can reach. Three more wins get Johnson to 20 and a lifetime exemption on the PGA Tour. At age 33, Johnson looks like a lock for the Hall of Fame and if he can add a few more major titles, a spot among the great players of all-time. 23-year-old Jon Rahm got the year off on the right foot registering a 2nd place finish. Rahm has made 42 professional starts in his young career. He has 19 top 10 finishes, 45%...that's pretty good. Player sponsors rarely draw my eye. This week's 3rd place finisher, Brian Harman busted out a new hat sponsor "MegaCorp." I guess it worked because I googled "MegaCorp." It turns out they are a logistics company, in case you were interested. Justin Thomas' regular bagman Jimmy Johnson had to WD from the Tournament of Champions due to a bout of plantar fasciitis. The injury will keep Johnson out at least a month and led Thomas to recruit Phil Mickelson's former caddie and Golf Channel Analyst Jim "Bones" MacKay for this week's Sony Open. Aussie Marc Leishman spends his offseasons in Virginia Beach; it's hardly considered a "hotbed" for PGA Tour players. Leishman revealed that he makes a periodic stop at his local Top Golf when the weather gets too cold. The latest podcast with Tom Doak is up. We discuss this week's PGA Tour site, Waialae Country Club a club that Tom is the consulting architect. 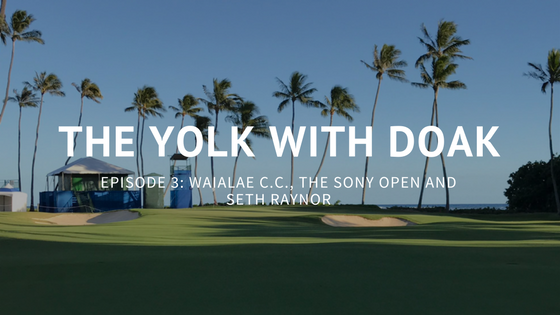 Tom talks about the changes made over the years at Waialae, this year's new greens, PGA Tour players and architect Seth Raynor. Listen to the podcast on our website, iTunes or Stitcher. For this episode, I also put together an article to follow along with that includes aerials of how the course has changed and photos of today's course. Shackelford calls for format shakeup at the Tournament of Champions. If you missed it, check out our article from Friday's newsletter about the massive municipal golf project in Boca Raton. It appears that Lynx, Club Pro Guy's top sponsor has turned on him (read the replies). Love golf? Never miss a beat by signing up for this newsletter, sent every Monday, Wednesday and Friday.